Erich Riebe, it seems, was born to play basketball. His grandfather, Mel Riebe, played for the Boston Celtics, while his father was an outstanding high school player. What made Riebe the standout he became at Waynedale and The College of Wooster was not just hereditary, though—it also took hours and hours of hard work. Riebe soon dropped football and baseball to concentrate on basketball, and it paid off. He lettered four times at Waynedale and led the WCAL in scoring his last three seasons, which were all followed by All-WCAL First-team berths. As a junior and senior, Riebe was First-team All-Ohio, All-District, the County MVP and Player of the Year in both The Wooster Daily Record and The Akron Beacon Journal. Not only did Riebe become Waynedale’s All-time scoring leader, the guard also led the Golden Bears twice in assists and was two-time captain. At The College of Wooster, Riebe started all four years, and was a three-time First-team All-NCAC selection, settling for Honorable Mention status as a freshman. He was voted best freshman, was team captain and MVP as a senior, and First-team All-Region as a junior and senior. Riebe finished his college career as the school’s All-time leader in assists, steals and 3-point field goals. He also ended at No. 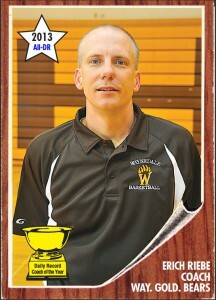 3 on the All-time career scoring list and won the Manges Award as COW’s Top Senior Athlete in 1992. Upon graduation, Riebe has found himself back where he started, serving as the head basketball coach at Waynedale. His teams have won two League titles.